The strawberry margarita is a festive and tasty summer drink. Plus, it's easy to make. This sweeter version of the classic margarita is perfect for summer cookouts and Mexican theme parties. In June, take advantage of berry season to add fresh-picked strawberries. In the winter, you may substitute frozen ones. Sugar the rim. For a festive-looking drink, apply raw (coarse) sugar to the rim of a margarita glass (as pictured above). To do this, put some of the sugar on a saucer-sized plate. Rub the inside of a cut lime around the rim of the glass. Invert the glass on the saucer and twirl gently until the entire rim is covered with sugar. Crush the ice. Put the ice in the blender and process for a few seconds until the ice is crushed. Combine the ingredients. Add the lime juice, triple sec, tequila and strawberries to the blender with the ice and process for 30 seconds to one minute, or until the mixture is smooth. Garnish the drink. Garnish the margarita by cutting a slit in a whole strawberry and setting in on the rim of the glass. Serve the margarita. 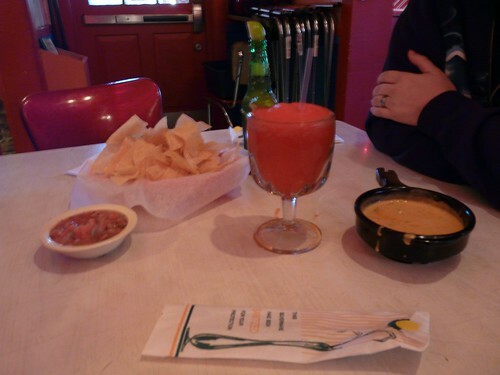 Serve the margarita on a beverage napkin with a (preferrably red) drink stir.